Elizabeth City, NC – The Tahoe is EPA-estimated at 16 mpg in the city and 23 mpg on the highway (2WD) – a nearly 10-percent increase in highway mileage over the previous models and 7-percent greater city mileage. 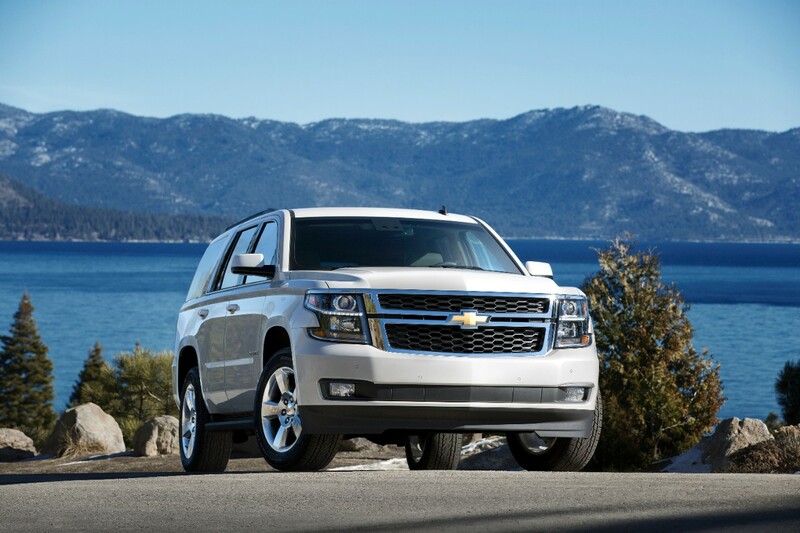 The 2015 Chevrolet Tahoe’s standard 5.3L V-8 engine, rated at 355 horsepower (265 kW) and 383 lb.-ft. of torque (519 Nm), features state-of-the-art technologies including direct injection, cylinder deactivation, continuously variable valve timing and an advanced combustion system, all designed to make the most of power, torque and efficiency across a broad range of operating conditions. Improved engine mounts, electronic throttle control, adaptive exhaust systems, improved aerodynamics and other technologies help the engine operate in four-cylinder mode longer with Active Fuel Management, further increasing efficiency. A Hydra-Matic 6L80 six-speed automatic transmission is paired with the new 5.3L engine and contributes to efficiency with reduced engine speed on the highway. It also features TapShift control, Tow/Haul mode and Auto Grade Braking. At the heart of the new EcoTec3 engine family is an advanced combustion system that maximizes the potential of the direct fuel injection system, cylinder deactivation, continuously variable valve timing and other technologies to ensure a strong balance between on-demand performance and real-world efficiency. The ability to more precisely control combustion also enables the new engine to run with a higher compression ratio, one of the best ways to simultaneously increase power and efficiency. This increased efficiency can now be maintained over a broader range of operating conditions. For example, when towing a trailer on a steep grade on a hot day, the advanced combustion system can reduce the need to trim back spark advance to control detonation, helping maintain efficiency with confident performance. The 5.3L’s direct fuel injection system precisely meters fuel directly into the cylinders, helping optimize combustion over a broad range of conditions. An all-new cylinder head design supports the fuel system and it’s complemented by a new, sculpted piston head developed to direct the injector’s fuel spray for better mixing and more complete combustion. To further enhance combustion, the intake and exhaust valve positions have been switched from the previous Small Block engine design, and the spark plug angle has been revised to move the electrode now closer to the center of the chamber to support optimal combustion. In certain light-load driving conditions, half of the 5.3L’s injectors quit spraying fuel, effectively turning the engine into a V-4 to help increase efficiency. This cylinder deactivation technology, also known as Active Fuel Management, is standard and uses oil pressure, controlled by the powertrain control module, to deactivate the lifters on selected cylinders, closes the valves for those cylinders, and seamlessly reactivates the cylinders when the driver demands greater power. The transition takes less than 20 milliseconds and is virtually imperceptible. The first Small Block V-8 was introduced in 1955 – a 4.3L V-8 that was an option in the Suburban. It was rated at 145 horsepower and 238 lb.-ft. of torque. Sixty years later, the new EcoTec3 5.3L Small Block produces 245 percent more horsepower and 61 percent more torque from only 23 percent greater engine displacement. The new 5.3L is built on a foundation of more than 100 million Small Block engines and four generations that came before it. Engines based on the architecture are typically smaller and lighter than competitors’ engines with overhead camshafts, and typically have lower friction – attributes that can enhance efficiency. If you have any questions about the new Tahoe Inventory please call us at (252) 338-9100 with any questions! Perry Auto Group has two dealership locations at 1005 W. Ehringhaus St, Elizabeth City, NC, 27909 or 1001 Halstead Blvd Elizabeth City, NC 27909. Elizabeth City, NC – The Insurance Institute for Highway Safety has named the 2014 Chevrolet Malibu with Forward Collision Alert, which is now available at Performance Chevrolet, a Top Safety Pick+. The distinction requires cars to receive high marks in crash worthiness and to achieve a basic, advanced or superior rating for frontal crash prevention. The crash tests consist of front, side, roof strength and head restraint tests. In order to receive a 2014 Top Safety Pick+ status, the 2014 Malibu’s frontal crash protection system had to meet IIHS requirements. The sedan also needed to receive “Good” rating in four of five crash tests. The 2014 Malibu exceeded those requirements, achieving a “Good” rating in all five tests. The 2014 Malibu’s available Advanced Safety Package, which includes active safety features like Forward Collision Alert, Lane Departure Warning, and Side Blind Zone Alert, contributed to its Top Safety Pick+ consideration. The Forward Collision Alert system uses camera and radar systems to monitor the distance to the car in front of the Malibu, and will sound an alert if it senses a possible collision. The Advanced Safety Package is available on 2014 Malibu 2LT, 3LT, and LTZ models. The IIHS simulates certain types of crashes that can occur on the road. They then evaluate the damage that occurred on key areas of the vehicle’s body structure and the risk of occupant injury. For instance, the Side Impact Crashworthiness Evaluation Crash Test consists of rolling a 3,300-pound sled into the side of a test vehicle at 31.1 mph. Similarly, in the Moderate Overlap Frontal Crashworthiness Evaluation Crash Test, the test vehicle runs into a wall offset from the vehicle’s centerline. The Chevrolet Malibu has been a Top Safety Pick for the past four years, but 2014 marks the first time it has been named a Top Safety Pick+. It is the second Chevrolet car to receive the Top Safety Pick+ rating, following the Spark mini car. While pricing for the 2014 Chevy Malibu has not yet been released, the 2013 Malibu starts at $22, 805. For more information, stop by our Chevrolet Dealer Serving New Bern, NC, or take a look at our 2013 Chevy Malibu Brochure. We can also help you save with our Chevy Malibu Rebates! Perry Auto Group has two dealership locations to serve you better at 1005 W. Ehringhaus St, Elizabeth City, NC, 27909 or 1001 Halstead Blvd Elizabeth City, NC 27909. Give us a call with any questions at (252) 338-9100.